You can use the finished ribbon bows to decorate all kinds of things. The sky’s the limit here😊 If you need an inspiration, have a look at this post here in which I explain how to sew handmade Christmas Ornaments. The ribbon bows really provide the finishing touches on this project. 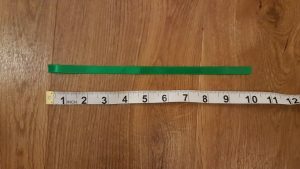 Cut a piece of ribbon of roughly 25cm / 10 inches. 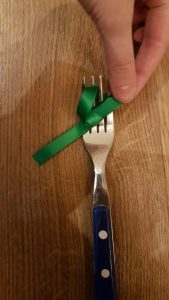 Lay the ribbon around the fork, hold the ends together on the left side. 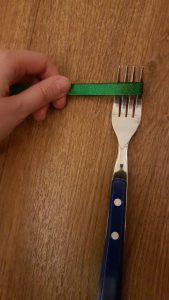 Take the rear end of the ribbon to the front and thread it through the middle gap of the fork. It’s important that you are below the other part of the ribbon when you thread it through (see picture). 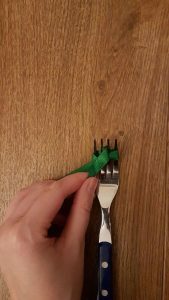 Take the end of the ribbon that you’ve just passed through the middle of the fork, pull it up and thread it through the middle gap of the fork a second time (but this time over the bow). Ok, the difficult part is over now. Well done! 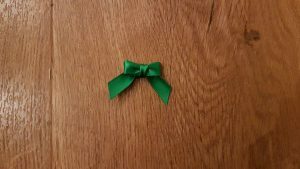 All that’s left to do is to adjust the ribbon bow until you’re happy with it before you tie a knot. 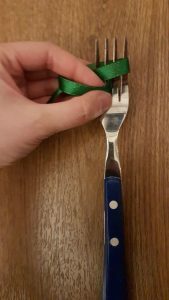 For the knot, pass the ribbon end through the loop (see picture below) and pull it towards the right side of the fork. 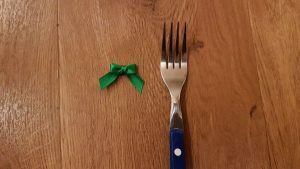 Carefully remove your little bow from the fork and cut the endings in a length that you like. Pro tip💡: If you have a ribbon that frays around the edges, hold the endings above the flame of a lighter – just for a second – to melt it a bit. With this method to heat seal the ribbon, your endings will no longer be frayed🔥 Kids, don’t do this step without getting help from an adult! Hope you enjoyed this quick tutorial! Feel free to share or leave a comment below. I’m keen to know how it went!